Grilling is always perfect any time of year as long as you can do it and most grilled meals are so easy just like these Grilled Steak Kabobs. My husband has always love grilling, we used to have this huge grill that was a gas/charcoal grill and smoker all-in-one. I hated this thing it was so huge it took up the whole back patio it was awful! One day he came home talking about this new grill called the big green egg. I thought he was crazy spending that kind of money on a grill but, I was fine with it because it was going to free up a lot of space. I didn’t know that I would fall in love with that silly grill as much as he did. I’ve never been one for grilled food probably because whenever my mom grilled we knew we were going to be eating burnt food. This grill makes everything so moist, so if you are looking for one this is it! So any way back to the tasty goodness of recipes to grill, my husband is always looking for something new we can grill. He really wanted kebabs but I just have only had a few times and haven’t really cared for them until he made these! 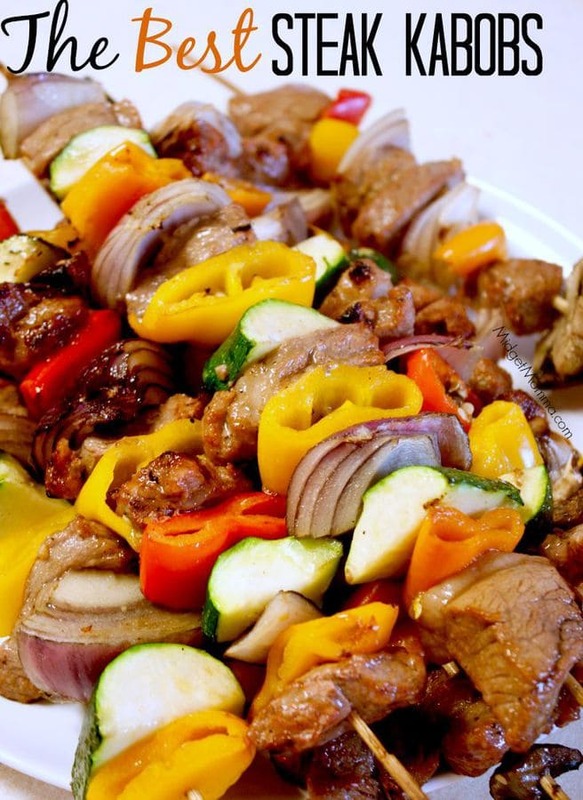 These are the best I have ever tried, these Grilled Steak Kabobs! 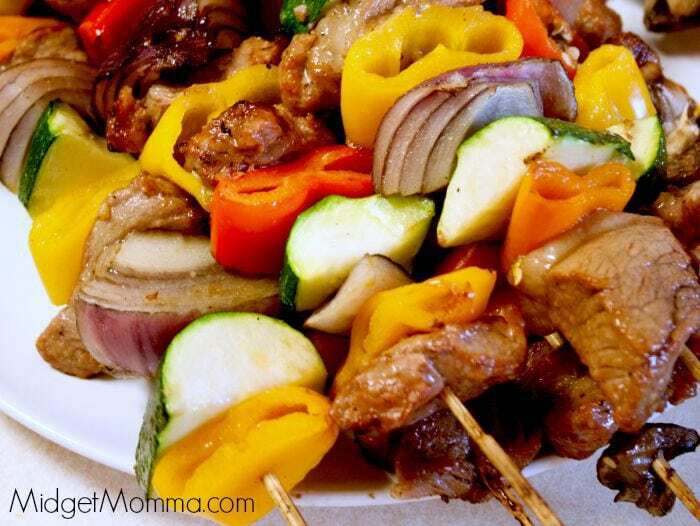 Make sure you pin these Grilled Steak Kabobs to your dinner board on Pinterest. Soak your skewers in water for 30 minutes. Slice your peppers, onion and zucchini into large pieces. Cut your steak into 1 inch pieces. Place your soy sauce, peach juice, oil, onion powder, garlic, pepper in a ziplock bag. Mix until combined. Add the steak and vegetables to the ziptop bag. Place in the fridge for an hour or two. Thread the steak and vegetables onto the wooden skewers, keeping a little space between each piece. Grill the kebabs on high heat for just a few minutes on each side.